Well, I never thought I would run more than I did in 2013 – but in 2013 I had a lot of injuries – constantly battled an ankle issue and still got over 2500 miles. Fast forward to 2014 and a year where I learned what to do and not do with my ankle I was able to break 2900 miles – including walking and running. What I learned was that I cannot really run on my ankles on tough trails often – I can do them, I love them – but if they are every day I end up having trouble walking – let alone running. So 2014 saw me do some road running – which I almost never did before and running more and more on easier surfaces – wide forest roads, bike paths, rail trails etc. It worked. In late April I returned for the third year in a row to the TARC Spring Classic 50k – had a great run – so nice to see so many friends again! In the area of “let’s try something new” I was led on again with Eric Sherman to try a fixed time event. I went down to New Jersey to run the 24 hour race at 3 Days at the Fair. We made a trip out of it and had a great time. We lucked out as our date of choice was warm and dry – the prior day was a monsoon! The day was a bit on the warm side but the overnight was great. I cruised right along – pretty much mixing up 25/5 (minutes) and keeping the stops to a minimum. Chafing got the better of me and started to slow me a great deal in the early morning. Around 5 am after I had long since PR’d for distance I stopped at our car/camp and got in the car to warm up as the sun was beginning to rise. At this point I had 79.5 miles. After about a half an hour I got out and carried on what was perhaps the ugliest ½ mile ever turned in – must have been about a half an hour – but I got my 80 miles, a PR and 10th place. Very happy – cannot wait to go back again next year! I did something a little off beat and different too last year. In memory of my mother and along with my family I was a team captain for the American Cancer Society’s Relay for Life in Peabody. My plan was to run the entire event the best I could. It was on a high school track with hundreds of people on it. 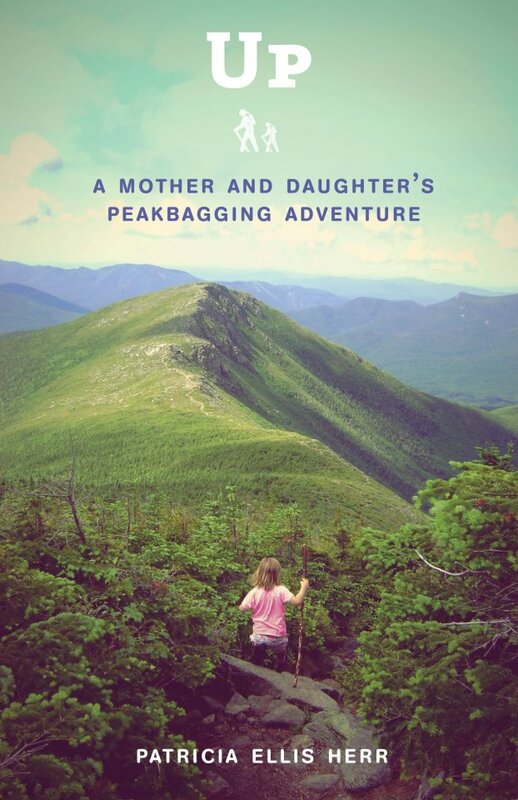 A great experience – the family camped and walked and I ran as much as I could. At the end of the event we had raised $3000 for ACS and I ran 62 miles. The kids did great – both getting well over 10 miles! After that was out of the way it was time to recover a bit and focus on the fall event – the return to Ghost Train. Yet another attempt at 100 miles. Last year was great until about mile 55 and then it fell apart – I wanted to give it a shot. As like so many New England ultras it was great to see so many friends – and to meet so many new ones! Scott Baver, Kim Vanyo, Luciana, Gail Martin, Colleen, Gwen, Eric Sherman…it goes on and on – great group of people! Kim and I more or less ran the first leg together and then did run the next 60-65 miles together – Eric Sherman was there for support and was going to join us for some miles after mile 67.5 to hopefully get us to the end. Much like last year I was really good until I was not. Looking back I know I did not take care of myself at the last aid station I was at and I slowly over the next four miles deteriorated to the point that Kim went off to get help and Eric walked me into the aid station. I will always think in hindsight I quit to easily. Kim fought off a very tough overnight of fatigue and got her first 100 and Eric who was just going to do a few miles on his pre-surgery knee ended up pacing her for the last 30 miles! A great experience! Well – I am just going to keep on running and walking fast. It works for me – it makes me happier and I love my running friends and the few events I do each year. 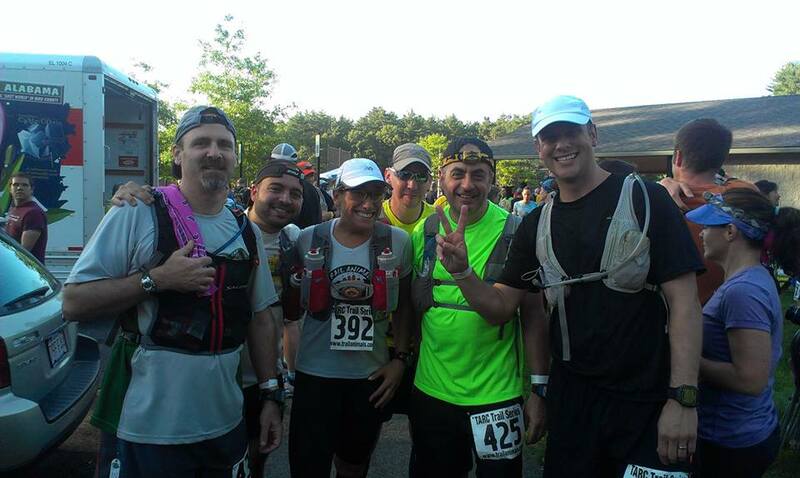 In 2015 I will do the TARC Spring Classic 50k again as part of my training for 3 Days at the Fair 24 hour again in May. The Relay for Life is happening again – but the city forced some changes. It is now 6 hours shorter, does not go overnight and is not on a track but in a field. My initial plan was to run two separate marathons in the 12 hours – but I am not committing to anything until after I see what the course looks like. If I do not like it I am going to walk the entire 12 hours. In a sudden curve ball I threw at myself on a whim the other night I decided to enter the Vermont 100. I was bumming out when my friends entered and I said “the hell with it” I want another crack at a 100 and not be the crew, pacer or following online. So this will motivate me a ton to get thru my training. Need to work on elevation, running and power hiking – and I will!! I also really need to be much more consistent about my cross training – core stuff cannot slide like much of it did in 2014! Thanks for listening – and all your support – hope you all have a great 2015! What a long crazy year – that will probably be my highest mileage year ever and a year where I did a lot, suffered a lot and learned a lot. I hope to be smarter going forward. The year began as I returned from Arizona with a 62 mile/100km finish at Across the Years 24 hour race. I ran through the winter and learned a lot about my bad ankles and feet and how little tolerance they have for snow and ice – and mud – even with proper traction. I just cannot deal with lateral motion – it really lays me out and can make even walking difficult. Basically I trained too much with no breaks until November. The fear of being entered in two, then three 100s kept me going even thru injury. I cannot help but think how stupid of me it was to keep training hard after the effects of the TARC 100 (25 horrid miles) had on me. I probably could have hit the Bear 100 stronger if I cut back for July – but I soldiered on…limping, wearing braces etc. Walking disaster. After a better fall I really cut back to much lower training levels for November and December and feel much healthier going into 2014. I did a lot of training in the White Mountains to get the elevation training I needed for Utah. After volunteering at the TARC Spring Thaw my first race of the year was the TARC Spring Classic 50k – which I paced my friend Kim to her first 50k finish. It was just a run with a friend – she did not need any help! 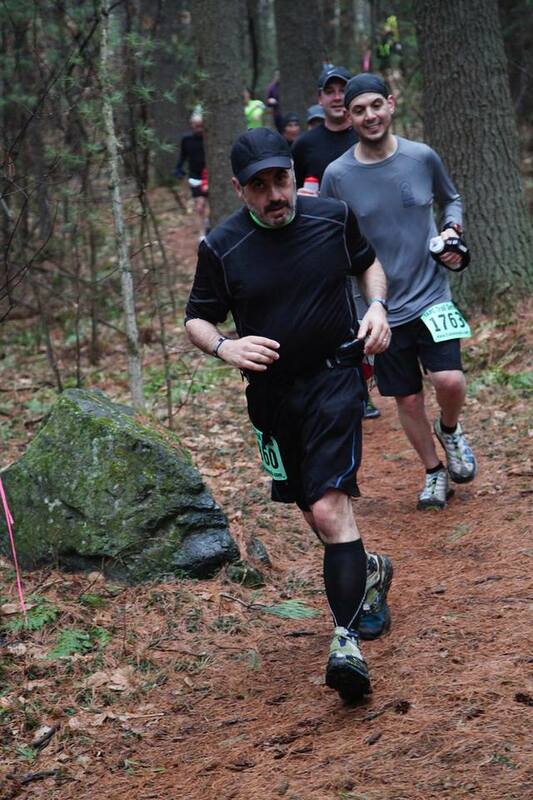 A couple of weeks later I did 18 miles at the GAC Mother’s Day Race and then I headed into the abyss of the TARC 100. The mud bowl that was that race shredded my ankles and I was done after a very slow 24 hours. It was fun to hang out and watch the carnage – and I was glad I was out of it. 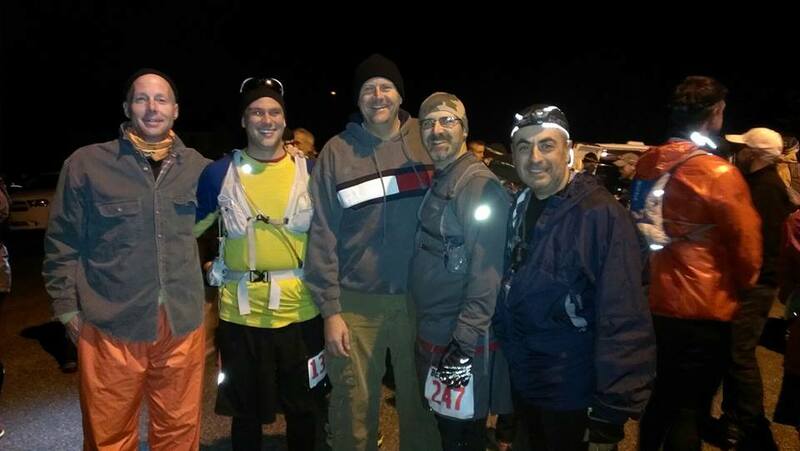 It was all pointing toward the “big” event – The Bear 100 in Logan, Utah. The race was in late September and I trained the best I could for it with so much ankle and foot pain – but I knew it was not enough. My real hope in the entire thing was to just get thru the night – beyond 24 hours and go as far as I could. It really went well – if slow. I was out there for near 11 hours and they pulled me off the course arbitrarily after I got about 50k. So – that was a disappointment but I also know I never would have finished…I think I could have got 60-75 miles. It all turned super positive when I was able to be part of a great crew with Eric Sherman, Dean Hugo and Mike Maher as we helped to get our friend Scott Baver in under the wire as an official finisher! The trip was a great experience and even with my result I am so happy I went. A few days after getting back from Utah I decided to enter the local Ghost Train Ultra. I figured I was trained for a 100 so I might as well use that training and go for it again – on a flatter and easier course. I am so glad I did this – it was an excellent experience for me and I was able to get to 62 miles/100km again. Bob Crowley, Eric Sherman and Scott Baver helped me a lot as I plugged through this race. It was also great to see my family show up at the 30 mile mark. At mile 52 I thought I was in excellent shape for a real shot at 100 miles – then in the next 20 minutes severe foot/plantar pain ended that. I pushed through it for a couple of very slow hours to get my 62 miles but I knew at the paces I was moving at it was not going to happen. I dropped. I recovered fairly quickly and had my first massage the next day – that was a huge help. Two weeks later I was at Stonecat hanging out (and was going to pace my friend Rob who ended up dropping early) and was able to pace Brenda Morris for her last two laps in the 50 miler. It was a lot of fun and a nice relaxing run in some beautiful woods. I decided to take a saner approach for 2014. It is not going to be twelve months of nonstop hard training. There is going to be a method to the madness. I am building base slowly and recovery between November and the end of February and I will begin to push the envelope in March and April as I prepare for my 24 hour race at Three Days At the Fair in New Jersey in mid May. Really want to put a very solid effort in there –which to me would mean I was moving for almost the entire 24 hours – whatever mileage that translates into would be fine with me – obviously I always want to beat my best of 62 miles and the 100 mile carrot is always dangling. 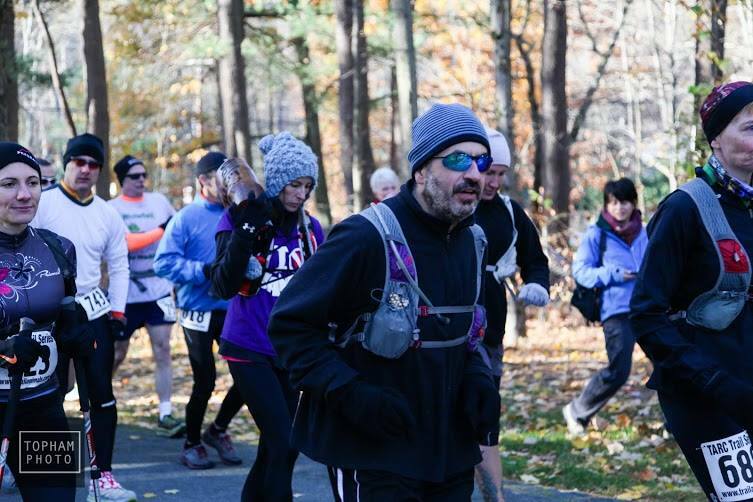 I will run the TARC Spring Classic 50k as a final tune up for this but as the race in New Jersey is paved I will be changing my training routine a bit…I will not be running exclusively on trails this year. 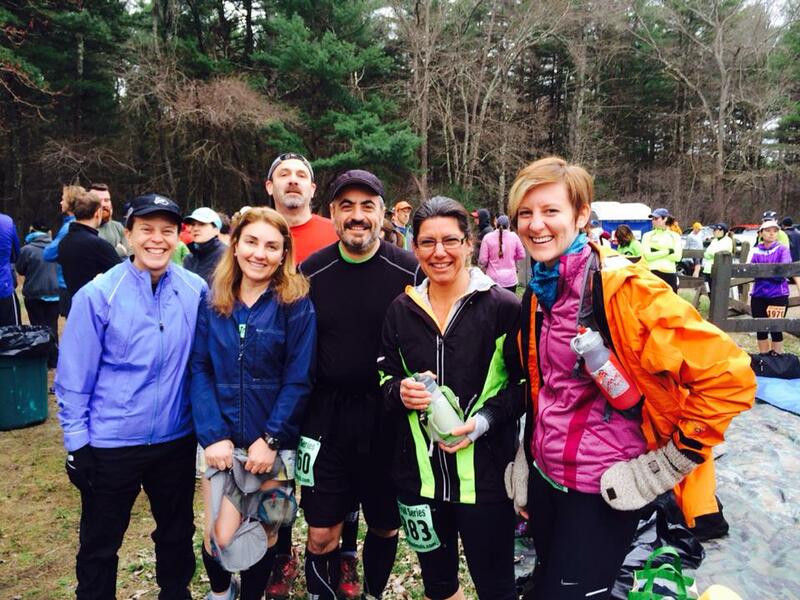 The second “key” race will be a return trip to the Ghost Train Trail ultra in New Hampshire. I will stick to my guns that this course is my best shot at a 100 mile finish. It is close to totally flat – well supported and just a lot of fun. This race is in late October and I will run the Pisgah 50k as my final big training run. As both of my key races are close to flat I am going to be sure to train on that type of terrain. I will do more pavement than ever and I will do some very long rail trail runs. I have a 50 mile road/trail training run mapped out that I will do as prep for New Jersey and possibly again for Ghost Train. In closing I want to thank my family and friends – particularly my awesome running community of friends that I have met through TARC. The sense of belonging and camaraderie I feel with all of you is something I have never known. All the best to all of my friends and family in 2014. A little over a year ago Eric Sherman (why do I listen to this guy?) told me about this 24 – hour race in Arizona named “Across the Years” which of course immediately got me to the race website to learn all about this idea of covering as many miles as possible in 24 hours. Of course there are also 48 and 72 hour (and 6 day coming in 2013) options on the dance card – Eric and I were satisfied to enter the “kid’s race.” We pulled the trigger very early on this one – we were entered and had our travel itinerary set by mid February. A few notes on traveling for races. You will need to bring a lot of things, particularly if the race is an ultra and you have to be concerned about a wide range of temperatures. With this in mind, flying with free checked bags is nice…we did this via frequent flyer miles on American, but Southwest and JetBlue are also options, you can easily spend a couple of hundred extra dollars on baggage fees these days. My rugged New England mindset did not respect the race temperature enough, I really wished I had packed warmer clothes for the night – there will be more on this later. One big piece of advice – make sure the hot water works in your hotel. We had lukewarm water the first night and I complained – when we got back from the race we had cold water. We ended up waiting three extra hours to hit the showers when we got to our much nicer hotel near the airport. All in all the traveling, especially considering it is winter and a major holiday week went very well – in fact, I am creating this article at 35,000 feet on our final leg home, and we are going to land early. I was very comfortable during the daylight hours with a start temp of around 40 and midday in the upper 50s. The first eight or so hours my TARC t-shirt was great (yes, I wore shorts too) – I wore sleeves and gloves for the first lap and after that was comfortable until about 8 PM when I added a long sleeve shirt. Later in the evening I switched to long pants with shorts over them, three shirts, winter hat (first one, then two) then for awhile even a fleece jacket. The temps would have been a minor issue if I were running and not walking, but it was slow going and it got cold even for me. Interestingly, after the blister repair, and getting going again I actually warmed up quite a bit again and aced the jacket and gloves. The bigger clothing and need for warmth issues were tied into a lengthy stay in the medical tent that I will describe below. We got into Phoenix around 9 PM and other than waiting way too long for our rental car things moved smoothly and we were to the hotel around 11 PM. We were able to pick up our numbers, race pack and select our tent the afternoon before the race, this is a great help to the terminally nervous. With our early check in we had a tent location that was right on the course. The Aravaipa running club is cut from the same cloth as TARC and GAC (and the ultrarunning community in general) – these people know what they are doing. Can you imagine a one mile loop that has port-a-johns in four locations, not to mention a heated inside restroom about 50 feet off the course as well? Incredible food tent and a great medical aid station where Sue and Todd worked on my late night/early morning blisters. Oh, did I mention there was even a second water station at the half way point? Even if you were walking slowly you were never more than 4-5 minutes from a toilet and 12-15 minutes from water – incredible. We stocked up on supplies- small cooler, snacks, lawn chair, table, etc., for our tent area and did very little else all day. With a little too much time on our hands we went for about a 50 mile ride up I-17 into the mountains. When we got out to look around I noticed Eric and I share the same disease – we cannot survey beautiful terrain without evaluating it for its trail running possibilities. An early dinner at a local Mexican place (my normal pre-race meal is sushi, but that scared me in a new city 400 miles from the ocean so I went with some not too spicy shrimp tacos) had us back to the hotel and resting by about 7 or 8 PM. We set the alarm clock and two smartphones for a 5:15 AM wake up. Seeing that we were already packed and checked in, and that we knew where we were going we did not feel the need to get there much earlier than 6:30 or 7 for the 9 AM start. Nick Khoury, the very thorough race director (and brothers Nathan and Jamil) gave the pre-race briefing at 8:50 and the race started promptly at 9. The course is very flat, with perhaps 10-15 feet of gain per loop. The course is over 90 % dirt with small paved and short concrete sections. The direction of travel is changed seamlessly every four hours. Although I looked at this as trail race it really plays out much more like run on pavement – the desert dirt is hard packed and you feel it much more than New England trails. Because it handles like asphalt and it is flat it is very difficult to run as slow as you know you should as much as you drill into yourself to slow down. I ran at the first 11 miles with Eric and we were clicking them off at around a 10:20 pace which was not sustainable for 24 hours. In an attempt to slow it down I decided to walk a half mile after the “fives” and a full mile after the “tens.” This was a brilliant plan but it was not enough – I should have gone in with a better walk/run plan – you need to remember constantly just how long you are going to be out the and just what is sustainable. As the early miles moved on I kept the pattern up and was doing OK but I was having foot and ankle issues but the 10 mile mark which maybe attributable to never running long on pavement. I was also way too impressed with my early splits. A gigantic red warning flag should have hit me in the head when I beat my 50k time from Pisgah. That is all great, but I had 17.5 hours to go! Sometime around when I passed the marathon mark I switched to a plan where I had broken the course into six short segments – of those six I walked three and ran three – I did that up until about mile 35 and then I was just feeling like I was going just as fast walking and I was able to maintain that. I told myself I would walk exclusively for the third four hour segment (5 PM – 9 PM) and I was able to do that, and for even a couple of more hours – see “THE ISSUES” segment next. After getting to about 47 miles I decided I needed to get my left foot looked at. At the 8 hour mark I switched out of my New Balance trail shoes into some newer ASICS road shoes – lots of new cushioning and I like them. Problem is I had never worn them for a real long stretch – more of a shoe I wear on a short run in the neighborhood or on the treadmill. They were good for awhile and then I felt a blister forming in the middle of my forefoot – the shoe was probably too constricting. After running thru it for a while (it was not a major annoyance) I stopped at the medical tent and got a quick patch from the EMT Sue – was probably in and out in 5 minutes. An hour or so later I felt the exact same issue on the right foot – this pretty much proved to me it was the shoes. This time things would not go so smoothly. I finished a lap that put me just over 49 miles and entered the medical tent. Sue was still there but this time I was number three on her list and I was in the tent for over a half an hour. The tent was heated and I took a load off. By the time I was repaired and ready to go I was as stiff as a board and got cold immediately upon returning to the trail. Within 100 yards out I was approaching hypothermia. I was shivering, teeth chattering and was having trouble walking straight. I pushed on and finished the lap – I was over 50 miles. At this point I thought I was done. I went to the food tent and got some hot chocolate and hot noodle soup and I went to the tent and put long pants on, two more shirts and a fleece jacket and two hats. I actually lied down on the cot and tried to sleep – I doubt I was there for 15 minutes. I got up and went to the warming tent and stayed there for a long time. Some how or another, around 12:30 AM I decided that I was going to get up and try again. It took me 10-15 minutes to get going but somehow I did and I managed to go pretty steadily (and slowly) until 5:07 AM when once again cold and tired, I thought I was done for the night. At this point it did not help that Eric was in the same boat. We were both in the warming tent with blister issues and cold and tired issues. We actually lied down on cold concrete – dozing off for perhaps 5 minutes. It was only marginally warmer in the tent, and the way some folks stood right in front of the heater it really did not heat the entire tent area. At daylight, for some reason I just decided to walk a lap. I knew I needed one lap to cross 60 miles and another lap to get within steps of 100km. I started to walk and another runner/walker (Kimberly Miller) was walking and talking with me. The daylight, conversation, seeing others in the same shape or worse etc. motivated me. I got the two laps between 7:30 and 8:30 and I called it a race. Not what I had hoped for, but an epic experience and I am very pleased with my ability to adapt, adjust and get moving again. I managed to keep a note pad on our table so I could make quick notes occasionally. One of the smarter things about this was recording the times that I took Advil because as the evening wore on I never would have had the wherewithal to remember things like that! 7:30 AM somehow got the urge to go again and eeked out two laps to get just under 62 miles/100km in 23:30 with 3-4 hours of down time and I was done. …and I took three Advil at 11 AM, 4:35 PM, 9:35 PM and 2:35 AM! I entered and challenged myself. Nutrition – I ate enough to never bonk – I managed this well – no serious nausea, no hunger. Hydration – A little tough during the afternoon as it was warmer and I was going faster – but I drank all day – probably in the 20 ounce per hour range – even after it cooled off at night. Electrolytes – took one S-Cap per hour – when I noticed a slight twinge in my hamstring during the heat of the afternoon I moved up to 2 caps per hour for 2-3 hours – I stayed ahead of the cramping curve. Getting back up after a disastrous stretch around 11 PM -12:30 AM – I was mentally convinced I was thru, but I got up and managed around 11 miles between 12:45 AM and 5:07 AM. It was not pretty – but I did it. Glad I stayed off the caffeine – I am not a user…other than a little dark chocolate and some hot chocolate I did the up all night thing (actually – it was more like 31 hours) pretty OK. And I only took a three hour nap in the mid afternoon. Was in bed last night from about 7 PM – 4:30 AM – needed it! Brought my mp3 player – I do not usually listen to music when I run, but it was a big help here – probably listened for about 8 hours. To what you ask? Jane’s Addiction, Melvins, Black Sabbath, Judas Priest, Smashing Pumpkins, Motorhead – I think that is the full list. It helped – a lot! The number one thing us ultra folks tell newbies (and I have been running ultras for less than a year) is not to go out too fast. Well, easier said than done sometimes. The easy course made it hard to go slow enough. While 10:20 pace is not that fast, it is if you are thinking about going for 24 hours – for me it is simply not sustainable. To put it into other terms, Joe Fejes who set a 72 hour record (over 320 miles) at this same race averaged over 13 minutes per mile – and I am nowhere near his level. He ran much faster at times, but my early pace was the set up for what happened to me. Equipment – my shoe mistake was dumb. My shoes were great and doing fine – there was no need to switch. And even if I chose to switch I had a second pair of the same make and model. Lastly on this subject – wearing shoes that I had only run for 3-5 mile road runs in a trail race was stupid. The blisters are not what stopped me, but the down time during my second stop in the medical tent was a killer. No blisters = no stop in tent. Back to pace – I was too impressed with my early paces – I should not even have been thinking about things like “how fast I ran ten miles” or “how fast I ran 50k” – a recipe for disaster. For all of the strategizing I did over the past 10 months on how I would handle and attack this I should have had a better run/walk plan from the start – not a “let’s see how it goes” plan. I think I would be likely to try and run third to a half of each loop if I try this again. You need to conserve for the long haul. If I did that right I could have possibly kept up a four mile per hour average for a long time. The entire process was a highlight. Planning and travelling with Eric Sherman went very well and we got along great – I am very glad he is heading to Utah with me in September. All of the great folks I have trained with over the past year – I am afraid of missing a name so I will leave it at that – you all know who you are. Doing something that is a challenge and that is not a “slam dunk” result wise is also a highlight. You cannot go into an ultra race and know how it will go or what your result will be. It is a major game of adaptation and adjustment. Race management is a key skill in this racket! All of the friends I have made in person and online – mainly through the Trail Animals Running Club have made this much more fun than it would have been as a totally solitary endeavor. 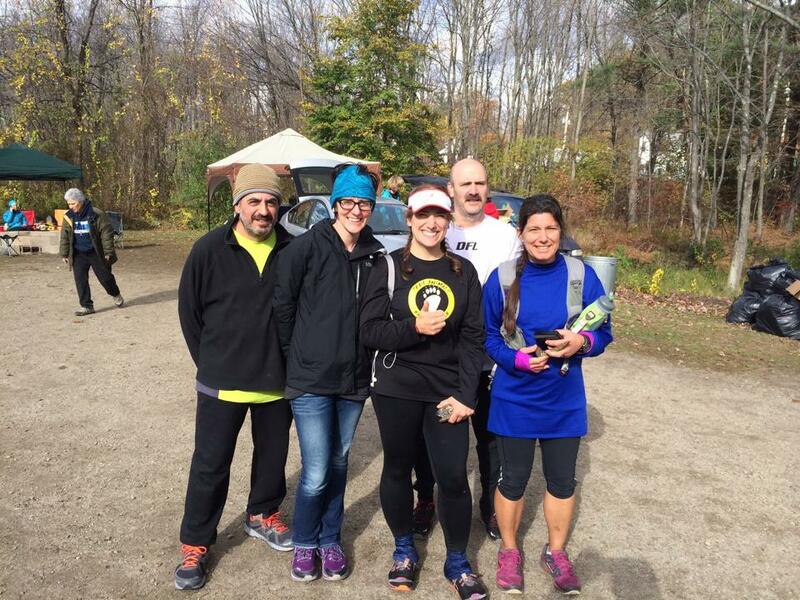 TARC is really perfect for me – low key and fun with runners of all ages and abilities – a really great group of people. So many of the people I met in Arizona – ultra runners everywhere are just damn good people. It was so much fun to meet people you have read about and to run a lap with them, say “hi” and to watch others battle the same things you are battling. Lastly, I am really pleased with how I managed a lot of aspects of the race. I am not a natural born athlete and I need to excel at the management end of these things to do well. I am pleased at how I handled the nutrition and hydration and how I got going again twice after very low points. 2012 will always be the year that I really got my running going again – I ran my first ultras (two 50ks, two marathons, my first 50 mile and my first 24 hour – I got tired just typing that!) I learned a ton. Across the Years was an excellent capstone event on a very good year that saw me get over 2200 miles of running – over 90 % on trails. I made a lot of mistakes at ATY – but I did a lot well too. I will take this experience and grow and learn from it as I move into 2013. I have my first 100s on the calendar this coming year – including the first 100 ever in my home state of Massachusetts (TARC 100 in June) and a return to the west for The Bear 100 in Utah and Idaho in September. There will be a lot of miles alone and with friends between now and then. It has been a very fun and challenging year for me and I look forward to many new challenges in the coming year. Scott Brown wants you to believe he is for the regular guy and familes. OK – fine – a lovely position to hold – but is it really how he has worked in Washingon? Scott has voted against tougher regulations on the pharmaceutical industry, against labeling GMOs, against restraints on farm-raised fish (which are known carcinogens) and against US citizen’s rights to buy similar prescription medicines from Canada. On top of this he took a $2500 campaign donation from Gerry Conigliaro, the owner of New England Compounding Center, Framingham – the same firm that is responsible for the deaths of 12 people and life threatening illnesses of 126 others. The embarrassment from this donation has led Brown to disassociate himself from it by donating it to the Meningitis Foundation of America after the fact. But none of this should matter – right? Because Scott Brown is for us – not for gigantic corporate interests and all any of us should be concerned about is what percentage of Native American blood Elizabeth Warren has. People around here think Brown is OK – just because he is not as scummy as Boehner and Kantor. Well to that I say what difference does that make if he votes how they tell him to vote and not in the interests of those he is supposed to be serving. Less than one and done for Scott – let’s send someone to Washington who works for people – not corporate interests – please vote for Elizabeth Warren for US Senate on Election Day. 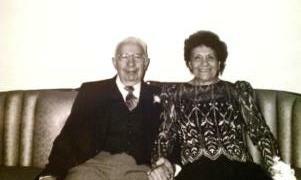 Monday, January 16, 2012 marks the centennial of my paternal grandfather’s birth. Rocco Saporito was born on this date in 1912 in Riesi, Sicily to Concetta (Sanfillipo) and yet another Rocco Saporito. My grandfather was my only grandparent who was born in the “olde country.” His father immigrated to the United States to find work soon after Rocco’s birth and his mom and he came about a year later. They all came through Ellis Island and settled in the North End of Boston for a few years before settling inEast Boston. My grandfather became the eldest of six siblings. For all of the questions I hounded him with when he could still answer them my knowledge of the family’s early years in Boston is cloudy at best. I know his father was a “laborer” – nothing ever more specific than that. Rocco remembered the Great Molasses Flood in the North End (it happened a day before his 7th birthday in 1919). At some point the entire family picked up and moved across the harbor to East Boston – I assume this happened sometime in the early 1920s. Rocco had a very good head on his shoulders – I was always, and still am amazed at how many things he could do and do well. The economy of the 1920s and later the Great Depression era ended my grandfather’s formal education around grade 8. Like millions of that era he had to work to help support the family. He served in theCalvaryand there are some pictures of him with his horse. He worked for a time at Daggets – a huge candy company that was located inKendall Squareand is now part of MIT. From what I heard the work conditions were horrid and my grandfather was not treated well. His life improved dramatically when he got out of there and got a job that he would hold until retirement in the mid 1970s at Gillette. Rocco also worked hard to get his GED – he always made a point of telling us all to pursue any education that we could get. He also always told me not to study liberal arts – I guess I blew it on that account! Rocco worked as a machinist at Gillette and helped to design and improve many machines that were used to manufacture and package razor blades. The man liked to build things! Grandpa married Grandma Fannie Bognanno in on November 28, 1935 – which happened to be the first day that Thanksgiving was a national holiday. Back in the 1930s leisure time was at a premium and weddings happened every day. Rocco and Fanny were not about to go off on a three week cruise for a honeymoon. My grandparents were way ahead of the times as they were always a two-income family. Grandma worked as a seamstress in big clothing factories – often making clothing for the military. Rocco always wanted more education. When I think of what a natural born engineer he was it is amazing to think of what types of work and careers he could have had if college had been an option for him. He could build anything – out of wood, metal or concrete and masonry. And when I say build – I mean build it right and of the highest quality. There are cabinets, patios, tables, chairs, brick walls, carports, laundry chutes, wiring jobs, plumbing work and more that are all still standing and in good condition many decades after Rocco built them. He had an eagle eye for measurements (another gene that escaped me) – he used calipers and micrometers and talked about things in “hundreths of inches.” A long standing joke between me and my Dad is that every time we see a picture on a wall we say it is crooked – because Grandpa always did that – and he was always correct! Rocco did not take shortcuts like me when he built things – he was also comfortable with more than just a hammer, crowbar and roll of duct tape! Rocco and Fannie had two children – my Aunt Connie and my father Ron. They were both born inEast Bostonbut for the most part were raised in post World War II Winthrop, MA. I have always romanticized and attached a “Leave it to Beaver” like charm to 1950sWinthrop. I am sure it was not all rosy all of the time. I would imagine that my grandparents were immensely proud to their children – Connie works as a nurse and my father as a hospital pharmacist. They managed to get both of their children educated and into a professional field – a big jump for one generation. I have so many great memories with my grandfather. He was forced to indulge my wish to ride to every corner of the Boston subway system, or to go fishing off the Saratoga Street bridge, let me run the massive cheese grater (these people were serious about freshly grated Pecorino Romano cheese – they were not Kraft users.) The man split beers with me (never asked for an ID) and truly wanted nothing but the best for his five grandchildren. Although he was soon to be diagnosed with terminal cancer he met my girlfriend, and soon to be fiancé Gail in 1993 and welcomed her into the family as if she had always been there. One of the ways that I have felt the luckiest in my life is that my grandparents lived long enough for me to appreciate them. The “devil may care” attitude about family many of us go through as teens gave way to a period in my 20s where I found myself living within a few miles of Rocco and Fanny and was able to spend a lot of time with them – and it was not all just showing them how to reprogram their VCR! We did some great things: going through old photos, talking about family history and our annual “let’s make 600 raviolis” for the holidays ritual – my back still hurts from all of that work – and more importantly – I can still taste the raviolis! Time moves forward – loved ones die – people lose touch – life happens. I will always appreciate my grandfather Rocco and all he did for us. As long as these great people are alive in our memories they are still with us. It has been just over a year since I last blogged – need to get going again – I think I need to stop writing magnum opuses and just get something out – well – this subject is a big one for me – the short writings will have to wait another day. No one ever really plans on it, but somewhere along the line many of us stop being young and active and start a slow downward trajectory towards poor health. I was no different. I was the typical American male that could easily get away with eating and drinking anything in my youth and still always being rather skinny and able. I somehow survived my teens and 20s – a decade plus was mainly involved with cigarettes and vast quantities of alcohol (beer by the case, booze by the bottle) relatively unscathed. Somewhere in the deep recesses of my mind I certainly knew enough to ease up a bit as I got into my late 20s – this is when I met Gail who would become my wife. I liked her right away and was actually afraid to smoke around her or let her know that I smoked. I had my last cigarette driving home after our first date. I even flirted with good health for a few years as I took up running – inspired by my Dad’s three consecutive Boston Marathon finishes. I started to run races and even completed a marathon of my own at age 30 in 1995 (Columbus, OH). Dad even finished another one with my sister in a monsoon inWashington,DC. The story continued for another year or two and sadly ended. I stopped running, and kept eating and drinking. It all has a way of creeping up on you and it is really hard to pinpoint anything in particular. You run less, you gain weight, you are not as comfortable – you rationalize. “Well sure – I am 25 pounds heavier than I was a couple of years ago, but that is still not that bad.” Then milestone numbers start appearing – and not good ones. 175 creeps to 180 – 180 becomes 190 – “which is fine – because, hell – I am still under 200” and then the wheels just come flying off. 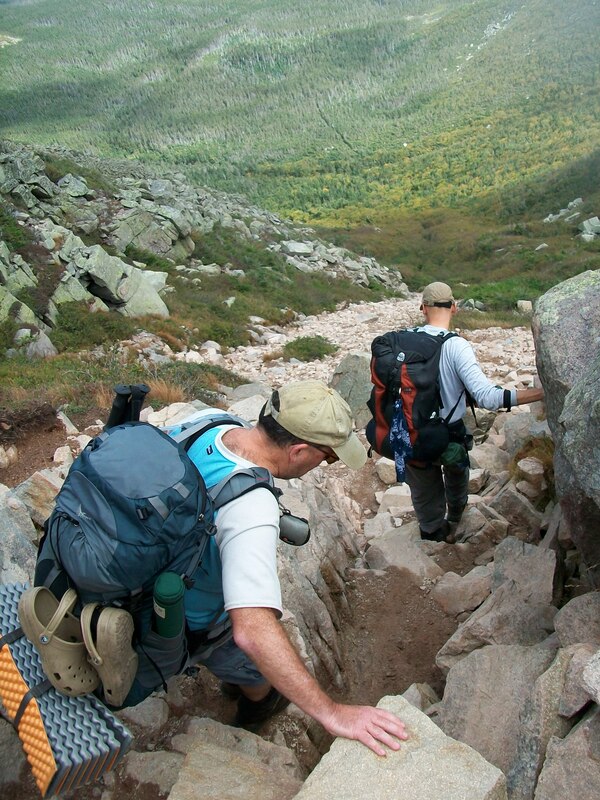 Even after I had some years of great activity hiking in theWhite Mountains(fairly constant since 2004) and quitting alcohol (with no real fanfare – I just grew to hate it and lose interest in drinking) I was firmly entrenched in the 200s. In 2008 while my Mom was battling terminal breast cancer I did something that appeared to be an unconscious decision at the time, but I know realize it was connected. I joined the local Weight Watchers in Danvers, MA (my Mom was a Weight Watchers Lifetime Member.) I decided that even though I quit smoking and drinking cold turkey – and had no interest in support groups, it was vastly different with food. I eventually learned that you can live without smoking or drinking but food is required. If you do not eat you will not be healthy and eventually you will die. Even though I knew a lot about eating a healthy diet and exercising I just never did, or cared enough for more than a meal or two. When I started this venture I weighed 225 pounds. In 2008 and I did a great job – I lost a little over 40 pounds by the time Mom died on my birthday. Again, it all seemed unconnected at the time, but this was also the time when I just stopped going to meetings, and stopped tracking my food and though I got away with it for awhile I slowly but surely crept back up. Over the next two plus years I outdid my prior zenith and topped out at 235 pounds on December 1, 2010. At this point, looking and feeling horrible I started to at least care a little about what I was eating. Wanting to not be one of those people who make New Year’s Resolutions I did not decide to go to Weight Watchers again until near the end of January – I checked in at Weight Watchers at 227 pounds. “So what is going to be different this time?” asked my group leader Melissa. Good question – and one that will be with me forever. A few things come to mind. I truly know that my time is running out – who did I think I was kidding? Lucky men who are in their mid 40s and that are 75 pounds overweight develop bad health conditions – the unlucky ones drop dead. I have had high cholesterol and high blood pressure – I have had no consistent exercise. I have been lucky so far – but I am kidding no one. I needed to commit to myself that this is how it has to be – tracking my intake, controlling my portions and eating fruit and vegetables daily had to become the routine, not the exception. Weight Watchers works because it is really just what we should all be doing anyways. No matter what you want to call it, a plan that has you eat appropriate portions, fruit and vegetables, and getting all of your fluid and nutrients every day is really just sensible eating. Weight Watchers calls is PointsPlus – I call it a plan for living and staying alive. The real key component for me with all of this is the weekly meeting, the group of people in the same boat with me that talk with me every Monday night in Danvers and a larger group of us who communicate on Facebook daily. Our Weight Watcher’s leader Melissa has been instrumental in my success, and I am sure hundred others would credit her as well. 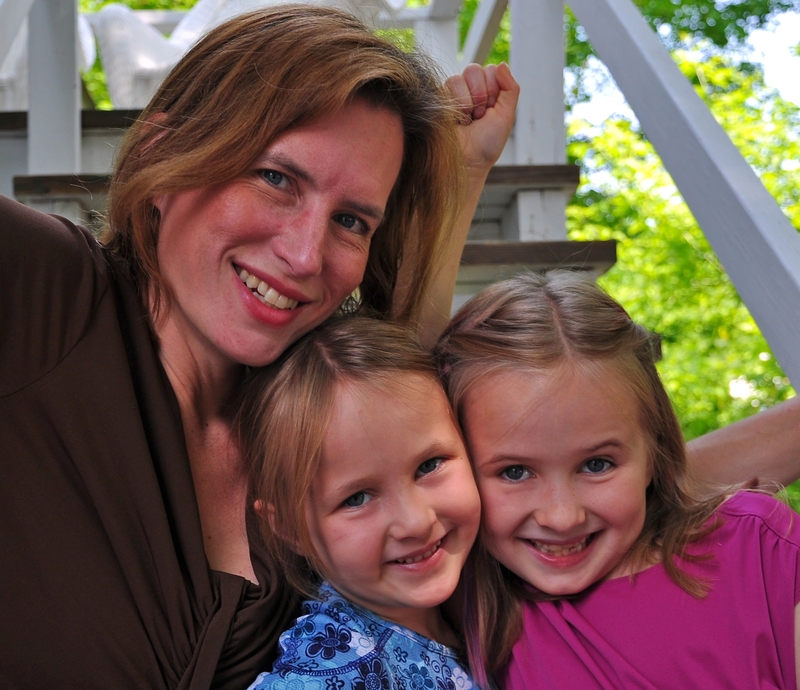 Like all leaders, Melissa has been there too – and like all of us – she is still there. We all know that we need to be more active and be aware of what we put in our stomachs. It is all too easy to “blow it off” and go off the charts. The weekly meetings, the online support and Melissa’s real life way of talking with all of us help to keep me accountable and eager to continue down the healthy path. I really mean this when I say that my Weight Watcher’s group and Melissa have at the very least turned my life around, and at the most have saved my life. Thank you. The other key component for me this time around is exercise. After taking about four months to get used to eating right I started running again. A little bit at first and then before I knew it I was able to get the distances back up to what I used to do. I have had weeks in the 40-50 mile range and have been running races at a variety of distances. I have learned that I have a love for trail running and have embarked on entering my first trail marathon – less than two months away. I love getting out in the woods – getting muddy and scraped from the branches. Beautiful scenery, wildlife, quiet time and it is all good for me. In June I added yoga to my repertoire. The benefits of this have been amazing. I am more flexible than I have ever been and soreness from long runs just melts away. I started with taking some early morning classes over the summer at the Peabody Lynnfield YMCA (thank you Connie) and have since had to alter where and when I go and I started doing Bikram Yoga in Danvers (heated yoga in a humid 105 degree studio.) My hope is that this practice allows me to stay flexible and active for whatever length of time I have left. So assuming that I can maintain my current weight for another 36 hours tomorrow night, September 19, 2011 becomes my new birthday – I will have maintained my goal weight (actually, I am about four pounds under it.) for six weeks and Weight Watchers deems me a lifetime member. This means I can continue to attend supportive meetings for the rest of my life, not pay monthly dues and I only need to weigh in once per month. I am down 71 pounds since December and 63 since I started with Weight Watchers. I am amazed. I have a lot of people to thank – so here it goes: The memory of my mother, Terry Saporito – she really stuck with this program and was never pushy with it – just encouraging; my wife Gail – who was tongue-tied at not being able to tell me some very difficult stuff – she knew how badly I needed to do this, but also new that nagging me about it was not the right way to go with me; my two boys (and a lot of my motivation) who were always interested in “how much weight did you lose this week Daddy?”; my much missed retired boss, June – another person who knew about the program and was very encouraging and helpful with advice; my leader Melissa – her sense of humor and personal experience really hits home with me and hundreds of others who have attended her meetings – she has seen it all, and while it is her job, she truly believes in what she does and has helped countless people get control of their relationship with food; to Carmen who runs the men’s meeting on Wednesdays – I attend that meeting on occasion and have taken a great deal from that meeting too; and last but not least – my friends, er, make that family from Weight Watchers, both in person and online – Lisa and Lisa, Sue, Mary, Janet, Annette, Renee, Marikay and everyone else – it is such a supportive environment where we all give and take so much. I’d keep writing, but I am going out for a trail run. I was going to skip this year’s annual trip to Baxter State Park due to too many scheduling issues but somehow or another I found a way to fit it in. Sadly, Eric who organized the trip this year had to bale out at the last minute so only three of us headed up this year. Maine is a very large state – one could fly from Boston to San Francisco in less time than it takes to drive to Baxter – the effort getting there and hiking to the remote corners of the park are well worth it. This year found me with good friends Marty and Larry heading out into the backcountry. We were there for four days to help each other thru the difficult spots and to merciless torture each other with bad jokes and awful humor – I cannot wait to do it again. I find these trips to be physically and mentally exhausting – but I also find them to be very cathartic – while you are in the middle of a death march you argue with yourself about “why do I do this?” but when it is all over it is a great memory and experience that I would not trade for anything. 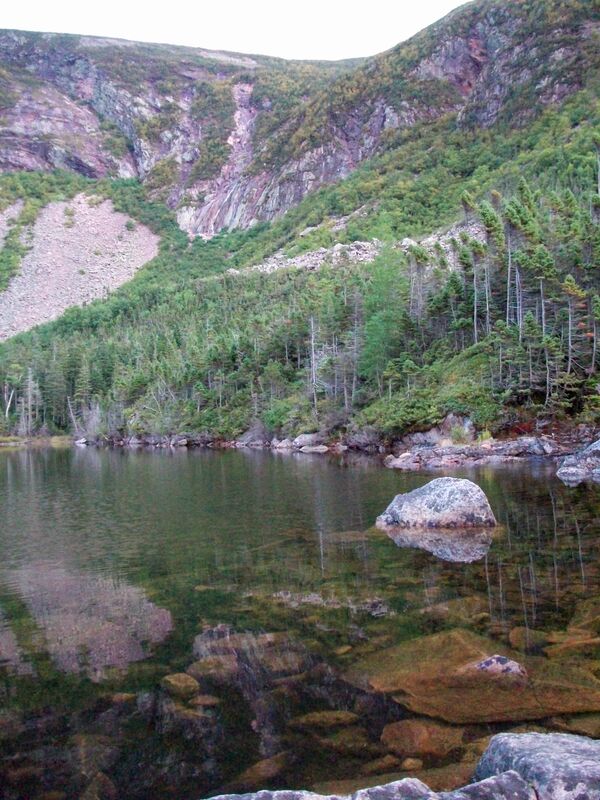 This year’s route would take me to the last remote outpost of the park that I had not yet visited – Davis Pond. To give you an idea of remote to get to Davis Pond you have to drive about ten miles into the park until the dirt road ends (and this is about twenty miles from the closest town, Millinocket. After parking your car you need to hike about 11 miles over two days to get to the pond that is nestled against steep mountain walls. This location is not visible from any road in the state. 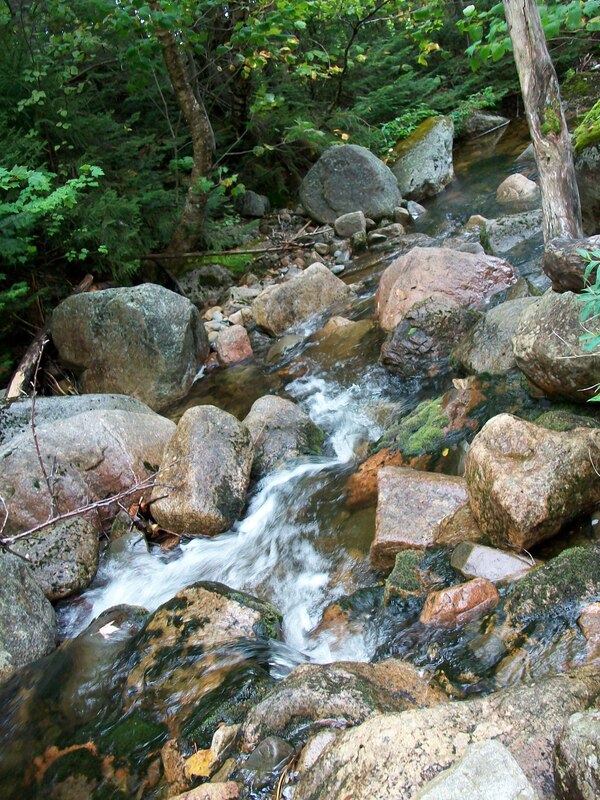 Day One took us from our cars to the Wassatoiquik Stream Lean To – a little under six miles of fairly flat hiking. 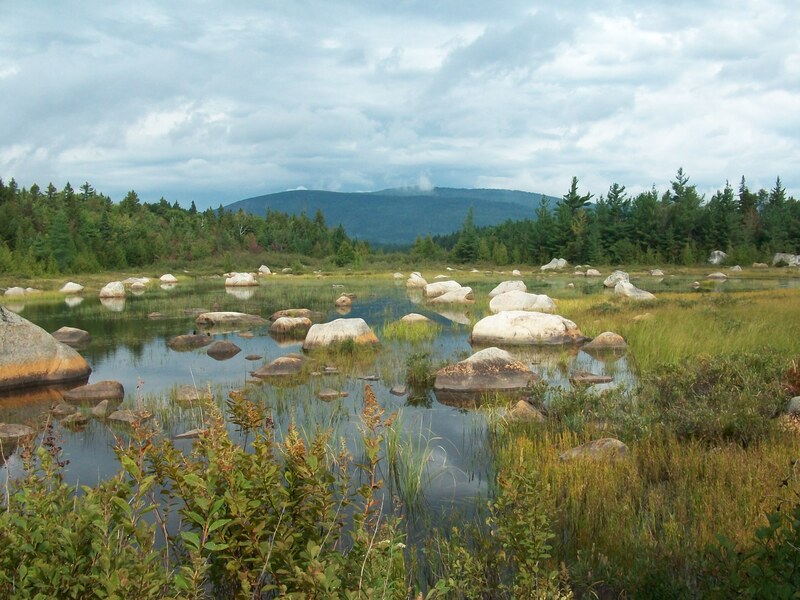 There are nice views of the Great Basin of Baxter Peak from Whidden Pond and some interesting boulders along the route. As would be a common theme this week there was also rain. Not too bad – we got to the lean to around 3 PM I filtered water, Marty gathered fire wood and Larry fished – this was the first time I ever saw Larry get shut out in back country fly fishing! 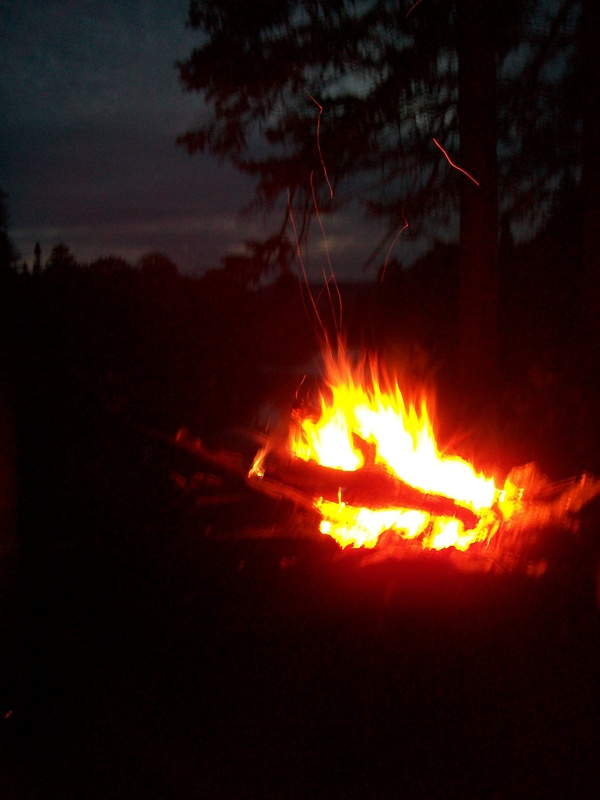 Dinner and the campfire took us up to around 7 PM – when night falls in the back country sleep is not far behind. You may not sleep well, but you certainly get rest – we got about 11 hours of rest per night! During the night a mouse or squirrel got a little bit into my food bag – no great loss – but the bear bag up in the tree did not stop them! It rained for many hours thru the night which caused a bit of concern as our morning started with a stream crossing and there would be a total of four of them on Day Two – the first one near the Lean To was uneventful and only about knee deep. We would soon pass New City – the remnants of an old logging camp and swing by Russell Pond Campground where we talked to a couple of other hikers. There was a bit of thunder off in the distance but it soon ended and we were clear of that worry. Just outside of the Russell Pond Campground we would pick up the Northwest Basin Trail which would be our route for the next day and a half. Early on you cross the Turner Deadwater which was a more challenging water crossing than the first one and head out for an easy mile or so of hiking – then it gets interesting. The trail starts to climb and climb and climb – up large boulders and slabs that are actually streams…nothing like going up steeply angled wet rock. We soon had and easy crossing of Annis Brook and soon after reached the scary stream crossing. We discussed how we would attack this one for quite awhile – we eventually decided to give it a try – took the boots off and some of us donned crocs, and one neoprene slippers and we gave it a go. Very slow, very deliberate and never more than ankle deep – but some of the rocks were hard to reach and the water speed was impressive and the depth of some of the areas looked pretty damn deep. We all made it, got the boots on and then it soon started to rain heavily for the next two hours as we plodded on towards Lake Cowles and then finally Davis Pond. The pond is as beautify and as remote as advertised – this is further away than the middle of nowhere. An incredible spot that is not visited by many people – you have to be willing to make the effort to get there – it is not easy. We had another lackluster meal in camp and a long night of rest before arising to tackle the steep 1.2 miles to the Tableland. For anyone who hikes often enough a steep 1.2 miles is not that big of a deal – but when you are backpacking with gear for four nights the weight on your back, and what it does to your balance and energy is incredible. Very slow going. 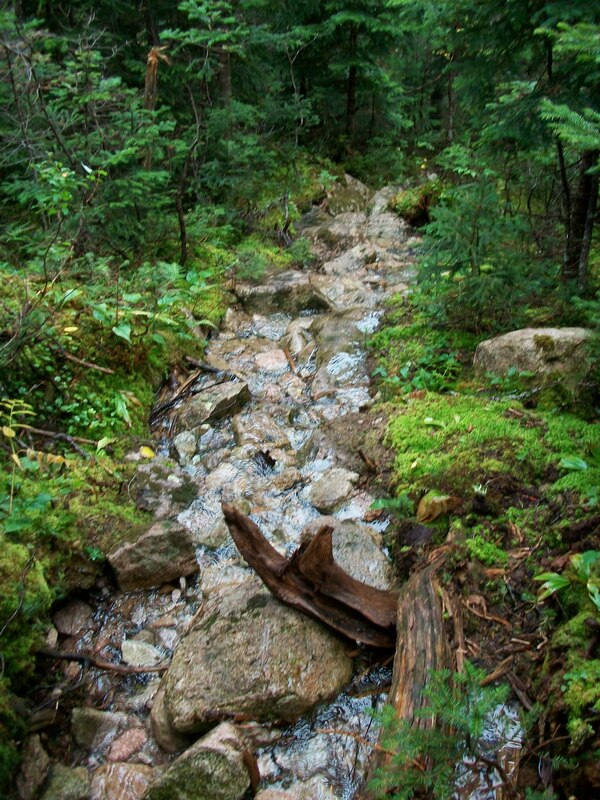 It took us over two hours of hiking up steep trail that was often a running stream to make it to the top. 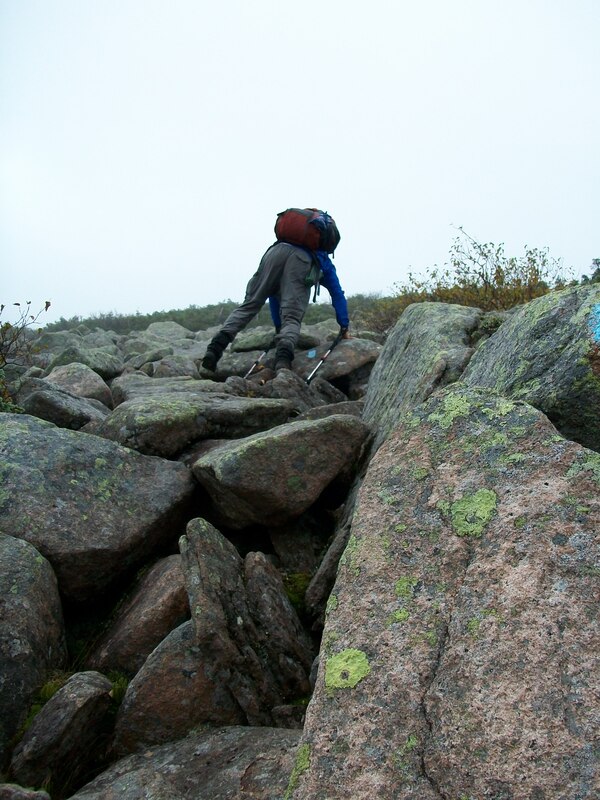 When we cleared the ridge we were rewarded with improving views and flat and downhill walking for two miles minus a quick side trip to Hamlin Peak – the second highest peak in Baxter State Park. After a couple of sweet hours above tree line with great views we began the hairy descent down the Saddle Trail – keep in mind this is the easiest route down! There is a small rock slide that is descended as well as a lot of big boulders – once again complicated by carrying a large overnight pack. I got a little edgy a couple of times when the pack was kind of pushing me off of the mountain. This is where companions are a huge help – a little coaching and another set of eyes and I was soon thru the worst of it as we made our way down to Chimney Pond for the night. We quickly realized the bear line that is provided here was no longer thwarting the critters so we opted to keep our food close by – very tame and unafraid red squirrels would raid anything they could – I saw one eating an apple it ripped out of a sealed Ziploc bag that was in a food bag hung at lest twelve feet off the ground! We were beat and were trying to figure out what we would do the next day – energy levels and weather would be the deciding factors in the morning. Morning came soon enough – and as I would have guessed, Marty, being in better shape had more energy and ambition than Larry or I did. We started out with the ideas of visiting the Pamola Caves but Larry and I soon had it with the compact car sized boulder scrambles and instead hung out by idyllic Chimney Pond and hiked around the campground. Marty went about 800 vertical feet up the Dudley Trail and was back in about an hour and a half and we decided that we would head home early. 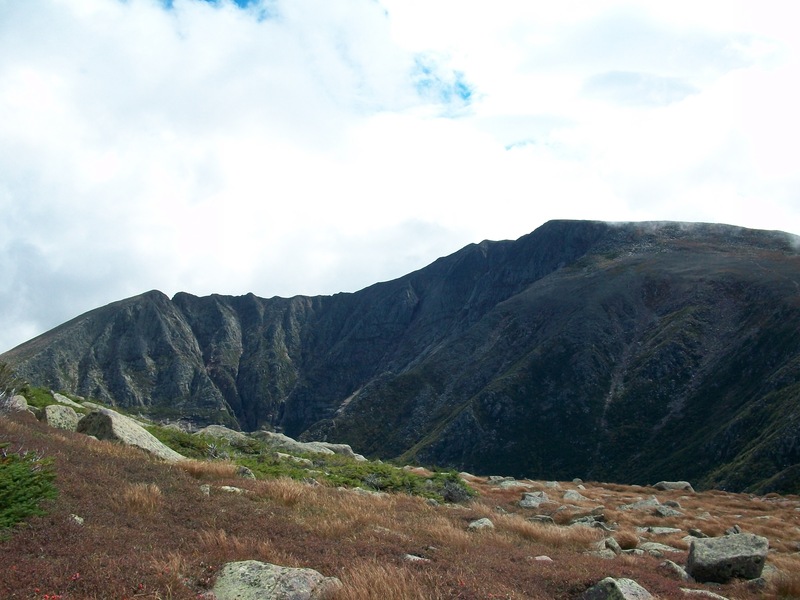 We hiked down a slightly different way and visited Blueberry Knoll on the way out – wild spot with views into the North Basin – very cool with fog and mist and some visibility. 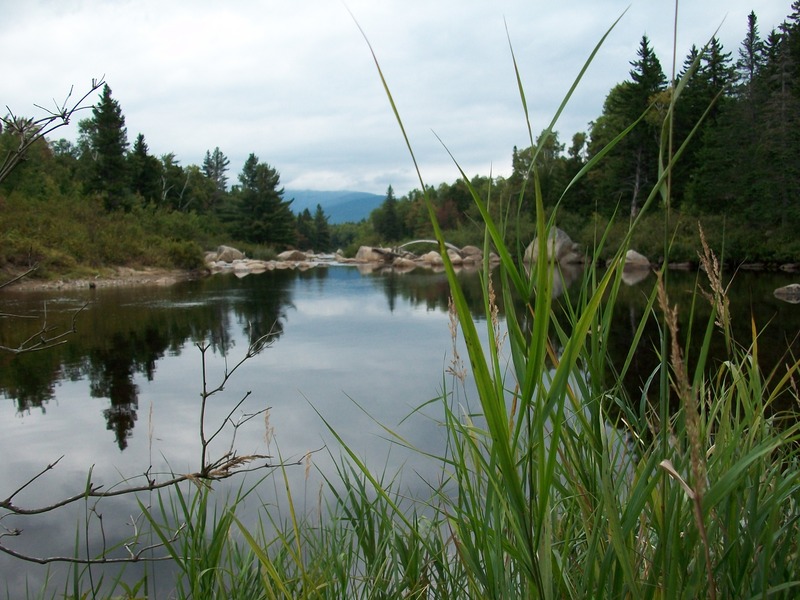 Soon we were on our way past the Basin Ponds and back to the car – a shower at a campground in Millinocket and the 5-6 hour drive home. Another great trip, with great friends has left me with aching muscles, over 400 incredible photographs and map books galore that I will read over and over planning out our next adventure. Baxter State Park Day Four.